jQuery Mobile Datebox is a plugin for jQuery Mobile that provide simple ways for users to interact with dates and times. They provide nine different options for date and time selectors. For our project, we used CalBox and TimeBox on the add and edit task pages . JQM Datebox was very easy to implement into our project. The plugin comes with numerous options that can be set to meet your exact needs. 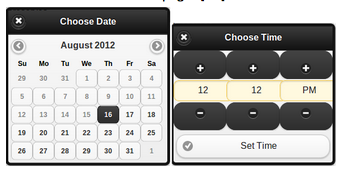 For example, we configured the date-picker to not allow users to select dates in the past. For our project, we envisioned having just one combined input for the date and time. This was surprisingly easy to implement using this plugin because it accepts callback functions for different events. We gave the plugin a callback function for when each dialog is closed. The callback for the date-picker will open the time-picker; the callback for the time-picker will save the user-input into the Backbone model and update the database. It is very easy to format the dates that the user selects. For our project, we formatted the date and time into ISO format for easy compatibility with the database. Python is a general purpose scripting language with a very simple rational syntax, allowing for the quick creation of readable programs. Much of its usability is derived from its indentation based syntax, interpreted run time environment, and ability to support numerous programming styles. Despite it being generally considered a scripting language, it supports a vast array of libraries and can easily be packaged into a standalone application . For our use case, Python was exclusively used to create a large number of randomly generated tasks to be inserted into the database. This helped extensively in testing the robustness and reliability of the application. BCrypt is a Node.js module that can be used to hash passwords for security. BCrypt appends a salt to the password which is a randomly generated string of characters. We used this module to protect all user passwords in the database. BCrypt is a hashing functional, meaning passwords are unable to be decrypted . When we need to check if a user-input matches the password in the database, on the login page for example, we hash the user-inputted text and compare the hash to what is stored in the database. The Node.js BCrypt module requires a C++ compiler, which made it unavailable when we tried to host the project on Windows Azure. BCrypt worked very well other than the prerequisites needed for compiling. Express.js is a Node.js module that creates a web application framework which creates more simple and less redundant server code. There are three main aspects of Express: setting up the application, requesting information, and responding to requests. When setting up the application, the developer can set a port and configure the view engine and routing preferences. The team set the view engine to use Jade, rather than HTML, for our project. The requests to the server determine what page is shown or if a query to the database needs to occur. Requests contain information about the requester such as what they are requesting, data sent with the request, and the URL the request was sent to. The server can then respond with the correct information, sending or displaying information in the form of a response . jQuery Password Strength Meter is a jQuery plugin that provides realtime client-side evaluation of a password, providing a visual indication regarding the strength of the password. The plugin can be used for any password input field and can be configured to have different tiers of security. It displays a simple, yet informative, progress bar showing the relative security of your entered password. For this project we used the plugin for all of our password input fields. This plugin provides no real addition to the functionality of our application, it simply helps to encourage users to choose stronger passwords. jQuery Mobile provides excellent support for displaying information as a modal dialog. This is a pop-up dialog box that the user must interact with before returning to the main page content. JQM utilizes a routing type system for this, creating the new modal dialog as a “separate page” with a hashtag in the URL, which means the user does not actually leave the page. In our project, this was a major inconvenience. We had to disable jQuery Mobile’s routing system because we chose to use Backbone’s routing system instead. This meant that the modal dialogs would not work with our setup. After many hours of research, we finally found SimpleDialog2, a jQuery Mobile plugin. It provides all of the same functionality of a normal JQM dialog, except it doesn’t use a hashtag in the URL. In fact, it doesn’t need to change the URL at all! Surprisingly enough, it worked on all devices we tested it on. The developer is able to choose one of three options for configuration: button list mode, button input mode, and freeform mode. Button list mode is a simple way of listing input buttons, button input mode is a way of having text input fields, and freeform mode is a way to insert your own HTML into the dialog . We used freeform mode to create a jQuery Mobile listview of users whenever user selection is needed. The list items are generated from options of a hidden select menu which is generated from the Backbone collection of users.